postseason awards announced at the Northwoods League’s annual fall meetings, which wrapped up Friday in Mankato. Caloia was named as the Northwoods League Executive of the Year in 2011 while the Madison Mallards were honored as the 2011 Organization of the Year. The Mallards set new attendance records in 2011, drawing more fans to their games at Warner Park than any other Summer Collegiate Baseball team ever has. In fact, while shattering their own attendance highs both in total (213,467) and per-game average (6,278), the Mallards out-drew 85% of affiliated Minor League Baseball teams each night and 100% of independent minor league teams. Warner Park, known to many as “The Duck Pond”, went through a $1.8-million renovation prior to the 2011 season. 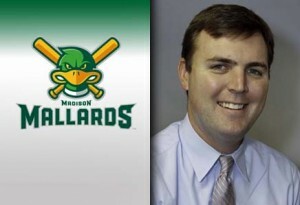 Caloia is completing his second year as the general manager of the Mallards.